Sydney trainer Con Karakatsanis and his father Tony have been charged with breaching race-day rules during the Melbourne Cup carnival with their sprinter Howmuchdoyouloveme. Father and son will front Victoria’s Racing Appeals and Disciplinary Board to answer five charges after suspicious equipment was found in the horse’s box before the Group II Yellowglen Stakes. Racing Victoria stewards alleged the trainer “committed a breach of the rules, or [engaged in] conduct or negligence that led or could have led to a breach of the rules”. The allegations relate to ‘stomach-tubing’ their sprinter Howmuchdoyouloveme on Derby day. Stomach tubes are used to administer bicarbonate of soda to slow the build-up of lactic acid in a horse’s muscles which can limit its performance. 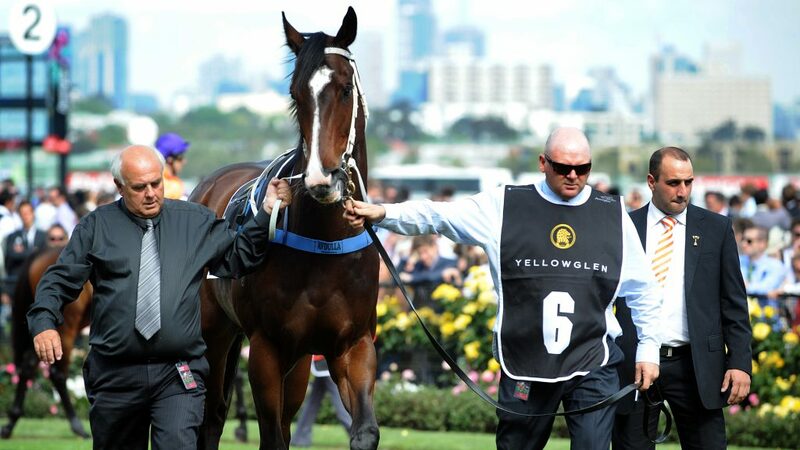 Before the race, Racing Victoria conducted a random inspection of the stables of Flemington trainer Steve Richards, where Karakatsanis had Howmuchdoyouloveme stabled, and discovered equipment used for stomach tubing in a feed bag in the horse’s stall. Stewards could not prove the horse had been illegally treated and allowed the horse to run. The fancied sprinter was the favourite for the Yellowglen Stakes but finished down the course in the Group II sprint. Tony Karakatsanis gave evidence after the race that he had picked up the feed bag by mistake and that he had meant to pick up an identical bag that contained a biscuit of hay. The inquiry heard the raid revealed the bag contained naso-gastric tubing equipment. After retiring from race riding, Karakatsanis took out his trainer’s licence and started training from his father’s Rosehill stables in 2007. His rise to fame has been headlined by the exploits of dual Stradbroke Handicap winner, Black Piranha. Karakatsanis declined to comment on the case to Neos Kosmos after advice from his lawyer. A date for the charges to be heard is yet to be fixed. Last month Queensland trainer Nathan Schofield lost his appeal against a 12-month disqualification for intending to treat a horse via a stomach tube on race day.